Starting with a two day warm up on the Trisuli river we ease into the paddling before we commit to a 10 day expedition down the Sun Kosi and Tamur rivers. The Sun Kosi, with over 270km of paddling, is considered by many to be one of the top 10 river journeys in the world. Finishing with a day run on the mighty Lower Tamur this trip has something for everyone. Progressive and intermediate kayakers will enjoy the flatter sections and easier rapids - allowing them to build and grow their skills, whilst the more experienced kayakers will relish all the rapids, running the bigger lines and playing their way down the river. 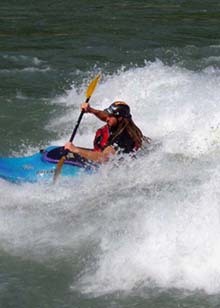 With full raft support we run the rivers with empty kayaks allowing us to enjoy the river and what Nepal has to offer. And those wishing to rest or avoid rapids can simply jump on the rafts. This trip is open to kayakers (and rafters) of all levels, and with expert guides and safety kayakers, hot sun and warm weather this is the perfect opportunity to improve your paddling skills and experience the magic of Nepal. The Sun Kosi is a brilliant river - at its best in medium to high flows with big bouncy grade III-IV rapids and lots of friendly holes and waves.Originating near Mount Shisha Pangma in Tibet, the River of Gold runs eastward through Nepal draining most of the eastern portion of the Himalayas. From the put-in at Dolalghat to the take-out at Chatra in far-eastern Nepal, the warm water of the Sun Kosi surges, snakes and winds its way through 270km of some of Nepal's remotest countryside. At the right flow this river journey is an incredible combination of exhilarating whitewater, beautiful scenery and glorious white sandy beaches and is truly breathtaking. The additional section of the Tamur is phenomenal with over 40 class IV+ rapids. It is quite possibly one of the best short river sections offered anywhere in the world. A few class III rapids provide a nice friendly warm-up and then its class IV pretty much all the way! By the suspension bridge at Chimrah youll have counted at least 25 rapids in 12km, and this really sets the scene. An impressive gorge of sheer rock walls finishes this magnificent river with a scenic finale and takeout at Tribeni, the confluence of the Sun Kosi. The last day completes the trip paddling down to Chatra. Different in nature, steeper and more technical, the Tamur is the perfect complement to the huge volume of the River of Gold and the perfect climax to any Himalayan river adventure. Free time before we take you to the airport for your flight home. Price includes: Airport pick-up and drop off, all accommodation, all meals on trip, guides, all transport during trip, internal flight, permits, national park fees (where applicable). Excludes: personal insurance, meals in Kathmandu, personal drinks (soft drinks, beer etc. ), tips, international flight.